All 16 boxes containing Little Brick Township fit perfectly into my Honda Fit. Folks, this is another useful post, so pay attention. And if you ever find yourself moving large Lego constructions, bookmark it. 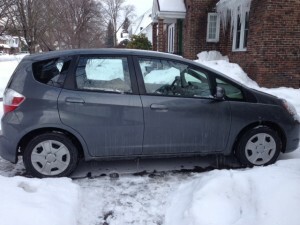 The Honda Fit has a name. It’s Gus. For the past month, I have been in the process of moving from Albany, New York, to New York City. Phases 1 and 2 of the move are complete, and yesterday, I drove my entire Little Brick Township — which has been packed into boxes since mid-January — from our old house to our new apartment. At this point, only one large house and two small houses remain to be delivered. Today, I spent the day unpacking and setting up the town on my two tables, and the process went very quickly because none of the buildings got broken along the way. 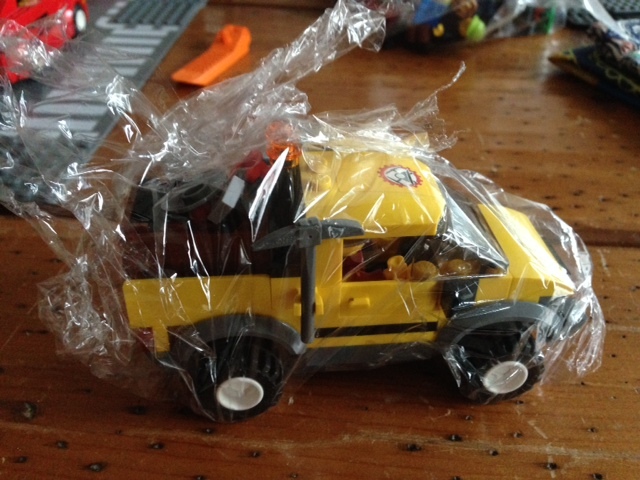 My shrink-wrapped Firehouse and its companions made the trip in excellent shape. Several people I know had most of their constructions smashed during moves (or decided to take them apart to keep them from getting smashed), and have not been able to rebuild them. Knowing that I may be moving one day, I consulted an expert Lego builder, Portugal’s renowned Pedro Nascimento, whose original constructions using hundreds of thousands of bricks have traveled throughout Europe and across an ocean to be displayed in Madeira. When a shrink-wrapped piece breaks off, it doesn’t go far, as this lamp on the modular Firehouse demonstrates. Taking Nascimento’s advice, I found or purchased boxes that would be a good fit for each of my buildings — not so small that I would have to force it in or I would have trouble taking it out, and not so large that the building would slide around in the box. 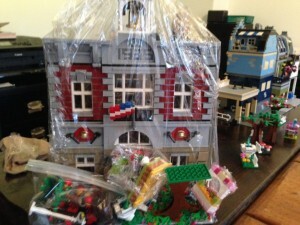 I then removed all the loose pieces, including trim that was likely to come off — an example are the four dagger-like pieces that adorn the roof of the Palace Cinema — and bagged them, along with the minifigures that came with the set or that I put into dioramas with that building. Then I shrink-wrapped the building, making sure that wrapping covered every part of the building so that if a piece did fall off, it wouldn’t go far. The standard plastic wrap one finds in the grocery store worked fine for the modular buildings, but you can buy larger boxes of shrink wrap at a craft store if you have one of the huge Star Wars sets. For some of the more delicate buildings, or ones that were packed along with cars, outbuildings, or other heavier objects, I wrapped bubble paper (which really isn’t paper but that plastic stuff) around the shrink wrapping and used packing tape to keep everything in place. 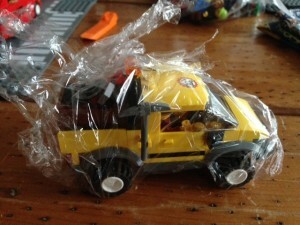 Cars, outbuildings, or containers with lots of small pieces got shrink-wrapped as well to keep everything in place. Then I stuffed all of the open areas of the boxes with light objects, usually vehicles but also minifigure baggies, so that there would be very little movement within the boxes. This mining truck had a lot of small pieces. By shrink-wrapping them, I could keep them all together. 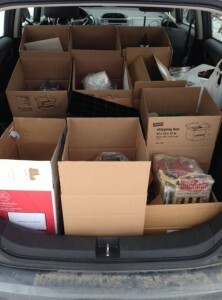 Since I drove all of the boxes to New York in my Honda Fit, I didn’t need to close and seal boxes, and in fact, I avoided stacking boxes to keep any of them from sliding off and spilling their contents. However, if you have to ship your buildings or send them with a mover (as it did with the Winter Village that I’d displayed at the pied-a-terre on West 47th St.), you should use bubble paper — and, preferably, bubble-paper wrapped objects for the sake of efficiency — to fill out the box so the constructions inside don’t slide around. Chef Melly only won second place, but her fellow chef at the Parisian Restaurant was still consumed with envy. Ouch. The pictures illustrate my packing process. It took only an hour or two to unpack and set up my buildings, and I used the various photos I posted on Instagram to help me remember where everything went. Since my tables are now configured a bit differently, I’ve redesigned parts of the town, but the core with Town Hall at the center, is pretty much the way it always was. 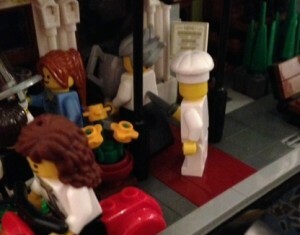 The minifigures will take a bit longer to set up because I’m thinking of new scenes and stories to create with them. And I still have holes in my new set-up, because I need to bring the few remaining items from Albany and add the Detective Agency that joined the Modular theme in January. But I’m quite pleased with the way the move went, especially since I’d been stressing about it for a long time. 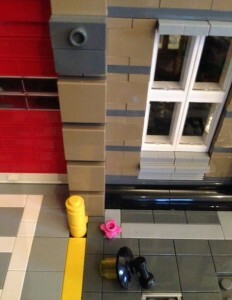 And I hope my advice helps make your Lego move a lot less stressful as well. Great idea to shrink wrap! I’m a huge fan of bubble wrap also for protecting delicate things. And the great thing about it is that it can be reused. I’m recycling mine to protect a dollhouse that I built for my daughter many years ago and just sold to a family with five girls. Impressive moving strategy, Lyn. Congratulations on the victorious move! Thank you, Sandra! I was so stressed out about the move that I packed up weeks ahead of time and stopped posting on Instagram for more than a month. Then, when I got to NYC, it took a couple of hours to set up.